Yes, it’s yet another picture of a fawn. This time the season is advanced and the little one is not quite as cute as it once was. The spots are rubbing off and it’s getting a bit angular in the face. 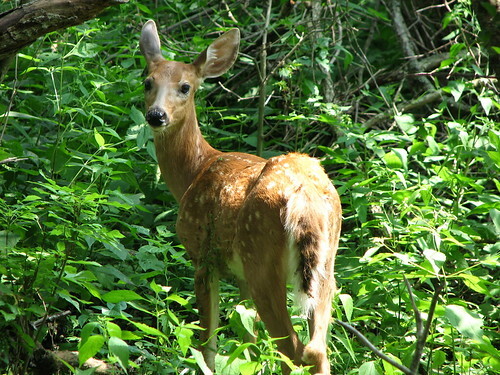 Here we have a teenaged white-tail dorking about in the underbrush. If he had a voice it would be cracking with indignation: “Hey, what you looking at old timer? Get lost!” The last time I published a fawn picture (in early June, I believe) it was of a pair of giddy young’ns prancing about like puppies. Not long after I shot that video a coyote downed one of those fawns and crunched upon its tiny bones. He chose the original video location to make his kill as if to make a point. The other fawn survived. There is a distinct possibility that this gawky deerlet was that very survivor fearful of my taking another image – deer end up dying when I “shoot” them! Now, I have no intention of publishing another deer picture just to talk about deer. I have much better things to do with this one. Upon close examination of the shot I later realized that this fawn had also been the victim of an assault. Look closely at the animal’s side and tail (see detail of de-side and de-tail below) and you can see that it is covered with Agrimony seeds. This critter was the victim of an Agrimoniuos assault! The result, however, was of a far different nature from a coyote assault. Agrimony is one of those plants which bear hitch-hiker seeds. They depend upon passing animals – usually mammals – to distribute their seed capsules. In the form of this fawn, we are seeing this tactic played out as it was originally intended. The seeds will eventually get rubbed or picked off and drop onto the ground in a place far from the mother plant. The plant is not terribly noticeable, being only 1 -3 feet high and rather gangly. 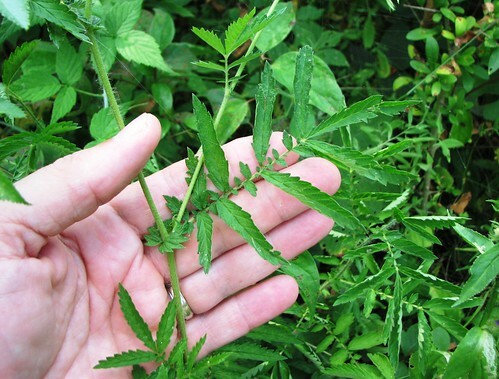 The leaves are compound with deeply toothed leaflets (see above). One distinctive feature of Agrimony leaves is that they have little leaflets interspersed with the larger leaflets along the petiole. Long slender flowering stalks extend up to deer belly height and bear a line of multiple tiny yellow flowers during the summer. 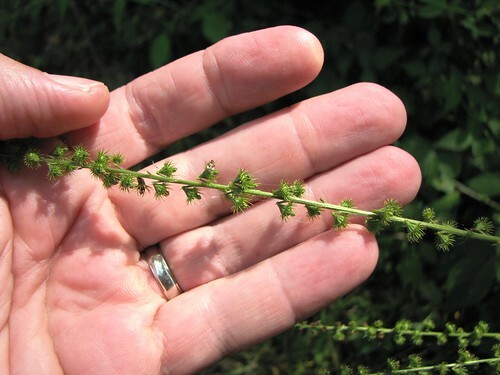 These flowers mature into cone-shaped seed capsules at summer’s end which are equipped with a ring of crochet hooks at the wide end (see below). These hooks, identical upon close inspection to those on the hook side of a velcro strip, latch onto passersby like a mail bag onto a rumbling train – it only takes a slight brushing to dislodge them. Often, as was the case with this fawn, the whole seed-bearing frond goes for the ride. Yippee! Specifically, the species in this discussion are called Small-flowered or Swamp Agrimony. These plants hang about in wetland or lowland situations and basically wait around for visitors. There are many species and Agrimonies are found throughout the world. So, as you can imagine, they are known by many names by many people. I’m sure European deer have names for them too (stickbutt, comes to mind) but because people do the naming on this planet we need to stay with what we know. Because of their fondness for grabbing onto folks as if desiring their company, they were once dubbed Philanthrops (like philanthropists or lovers of mankind). In England they are known as Stickleworts or Harvest Lice. The English names certainly have a nice Dicksonian ring to them. In fact, Agrimony itself is a Dickens type name because it has a negative sound that fits right into the Scrooge and Marley mode. You needn’t worry about looking for Agrimony, Sticklewort, or whatever you wish to call it, for it will find you. It has no preference as to nationality or even species! O.K., so I was wrong. It happens every once in a great while – like solar eclipses and comets that arrive only a few times in a lifetime. O.K., so I am wrong about the infrequency of my wrongness, but I rarely mistakes (insert wink icon here and add the word “make”). Anyway, in the presence of small quick flying metallic green hymenopterans (bees and wasps) I generally resort to calling them cuckoo wasps. 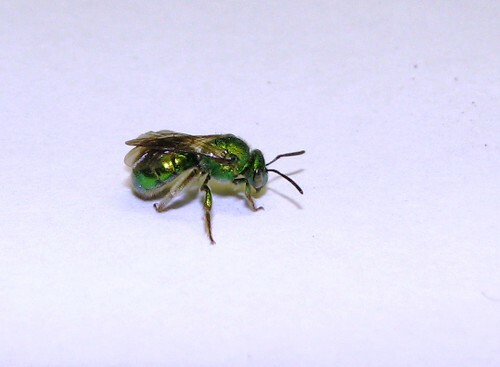 These emerald iridescent creatures get their name from their habit of parasitizing other wasps, just like European cuckoos which lay their eggs in other bird’s nests. They are electric green and fairly common, so most of the time my cuckoo wasps turn out to be just that. In a recent episode of hymenopteran naming, however, my cuckoo wasp label turned out to be, well, cuckoo. During the initial stages of an archaeological dig, which I conduct as part of the interpretive program at the museum, we started scraping the soil to begin the day’s dig. A few electric green insects were exposed a few inches down and they took wing soon after being revealed. “Cuckoo wasps, “ I confidently proclaimed. A few more came to light after a few more scrapes and again I identified them as cuckoo wasps to the volunteer archaeologists around the pit, although I was beginning to wonder what was going on. You usually don’t see a whole bunch of cuckoo wasps together any more than you see a flock of cuckoo birds. There was an outside chance that this was an unusual example. The third bout of scraping uncovered something very unusual indeed. This find proved to be the one which allowed me to de-cuckoo my green insects and give them the proper name they deserved. There in the soil appeared something which appeared to be a perforated metal plate (see here a camera phone image of the find). In fact, one of the diggers pointed out that it looked just like an A.C. Delco Oil Filter – a PF3361 to be exact. Now this archaeological site is an old house site that dates Ca. 1800-1860, so one wouldn’t expect to find an oil filter there! Whatever it was, it was very hard but didn’t feel like metal. It felt more like hard cardboard. Just about the time I was about to proclaim it an early paper version of an oil filter, several of those green “cuckoo wasps” poked their heads out of the “holes” (see detail here). 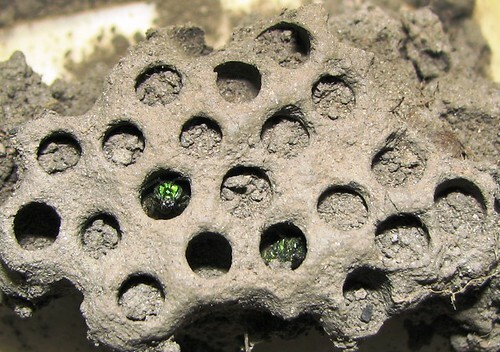 Since cuckoo wasps don’t nest in colonies, these things had to be something else. In other words, I was wrong. In the final diagnosis, this structure turned out to be a grouping of Halictid Bees. I was able to arrive at the correct solution after hitting the books and looking at a few internet references. Even though the general appearance helps, the final call came only after examining the wing venation – the details of which I will spare you. 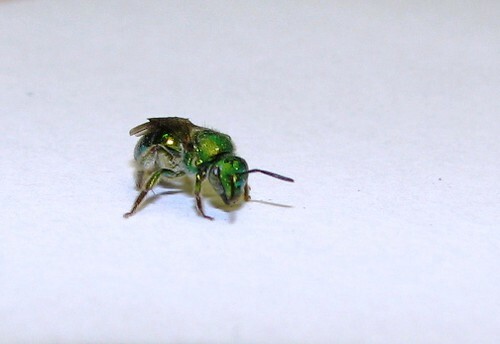 These metallic green bees are sometimes referred to as sweat bees because of their alleged habit of licking up perspiration. In detail (see below and beginning photo) they are stunning examples of the bee clan. Most of the exposed bees were newly emerged adults fresh from the pupal stage. There remained one more hurtle to overcome in this case. Halictid Bees are solitary bees which dig burrows in which to raise their young. They are not colonial. So, why the hive-like look? In this case what we have is merely a collection of burrows. The individual bees do not work together and, although they may talk over the fence every now and then, they do not barrow cups of sugar. Beyond the even pattern of holes, the individual burrows take their own divergent routes. This type of Halictid Bee is actually taking some evolutionary steps back toward colonialism (and no, I did not make that fact up). Now, we have all the answers in one place and the world can remain turning. I could only imagine the consequences of discovering that our early Michigan settlers used AC Delco oil filters and that cuckoo wasps run the earth. Unfortunately, it was too late to tell all this to my volunteers. I’ll have to fess up next time I see them. Come to think of it, our dig season is over, so I won’t see them until next year. Gee, I hope I don’t forget to bring the subject up. There’s a lot of bull in this world. No, I don’t mean the “B. S.” kind of bull, although there is plenty of that to go around too. There are many things that bear the name “bull” something or other – a term usually attached to denote something large or pugnacious. For example, bull thistles, bulldogs, bulrushes, bull snakes, bull sharks, and – of course – bull moose and bull cattle are good examples of living things bearing the name. There are no bull shrimps as far as I know. Bull Durham is a tobacco and a movie, so it doesn’t count – either does Kevin Costner, although he can be full of BS at times (by that I mean big screen, I think). Since there are so many bull-like things roaming and growing out there, it is inevitable that they will come in contact with each other from time to time. Most of these contacts are of a benign nature – bull cattle won’t each bull thistles, for instance, so they let them be. If a bull moose were dropped into the ocean, then the bullshark would definitely be at an advantage, but there is no logical scenario on earth that would put a bull moose with a bull shark unless they are both dead and stuffed in a museum. In that realistic case, however, they would get along famously. Realistically, there are situations in which an encounter of bulls could be deadly for one or the other. Bull moose will eat bulrushes on occasion and bulldogs could rip the tar out of a bull snake if they were in a suitably pugnacious mood. 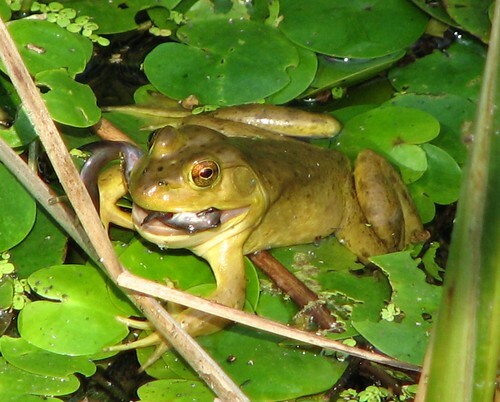 On a recent walk I encountered just such a negative merger of bull-named things – a bullfrog in the process of eating a bullhead. The frog initially caught my attention because it was in such an odd upright position. I didn’t see the reason for this pose until I focused my lens on her. Although not as exciting as smack down between a bull moose and a rodeo bull, it was interesting – in a slow motion sort of way. The frog was a medium-sized individual, about hand-sized, which had selected a 4 inch bullhead catfish for its meal of the day. Had the quarry been any other critter, it would have disappeared down the big frog’s gullet without delay. 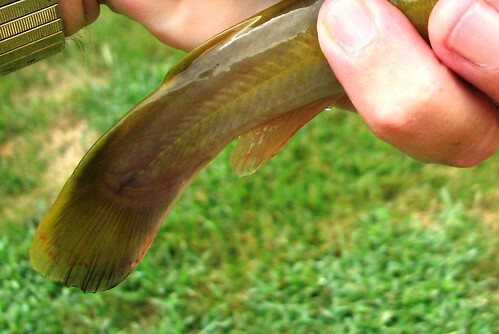 Bullheads are armed with spines, however, and they don’t go down so easily. The frog probably made the grab long before I came upon the scene. As a reaction, the small bullhead would have locked its pectoral (side) fin spines as well as the single spine on the dorsal (top) fin. Rather than rip himself a new esophagus, the frog simply waited for the fish to die. He waited at least ten minutes into the period I watched him, during which time the hind end of the fish hung out of his mouth like a wet noodle. Without any expression, and only an occasional pass of the front foot over the prey, the bullfrog remained motionless. Finally, the limp fish was re-positioned sideways and folded in half for the stomach-ward journey. I would think that this would have been the worst way to swallow a spiny fish, but what do I know. I gave up on catching the last gulp since it was going on twenty minutes and I had some drying paint that needed watching, but I’m sure the deal was all but done. 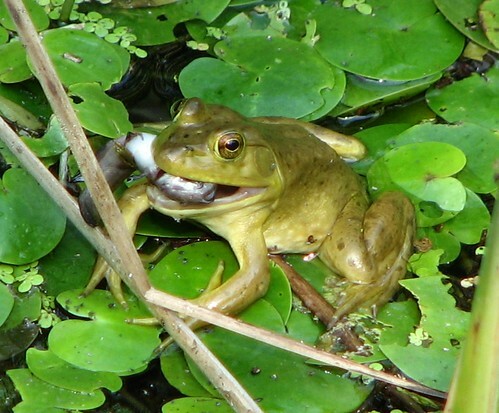 Bullfrogs will eat just about anything that will fit into their mouths. This list numbers insects of all description such as dragonflies and moths, but also includes other frogs, mice, and even small birds. Fish are on the diet as well, but not as often as you’d think because they generally don’t take prey under water. I suspect this individual popped the bullhead as it rose to the surface to catch some prey of its own. 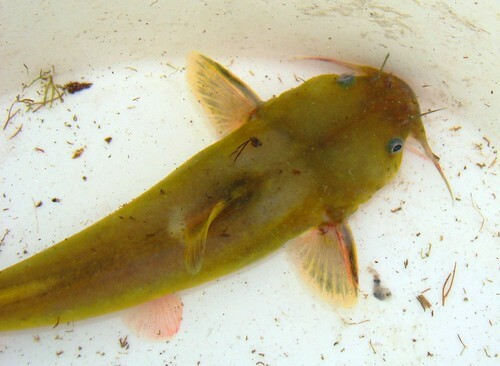 Bullheads are also known for eating just about anything – including frogs – so there were several layers of poetic justice going on in this case. 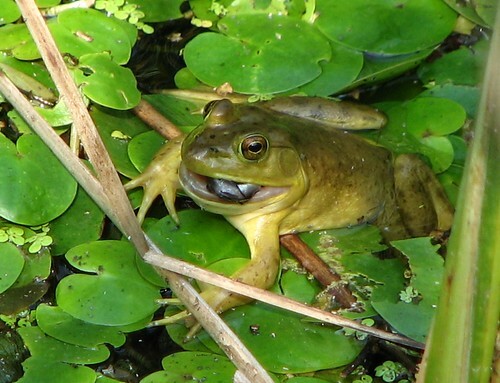 As a final piece of semantic completeness in this bull-eat-bull situation, the small pads upon which the frog was perched were obnoxious alien plants which are new to the Lake Erie marsh scene. They are called, and I am not making this up, European Frogbit. 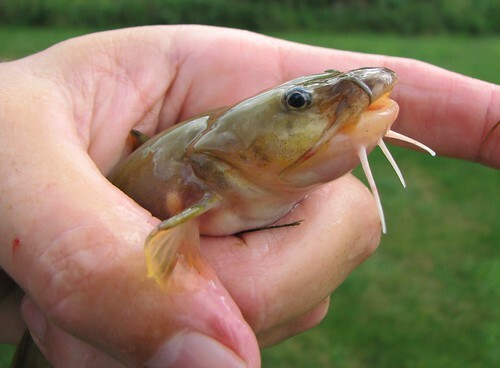 So, it appears, bullheads have bullfrogs to bite ‘em and pads under the frogs that bit ‘em… and that’s no bull. If you think that Gray Tree Frogs are gray frogs that live exclusively in trees, you’d be mostly correct. If you are one of those types who want to be right all the time, however, then you shouldn’t say such a thing. This statement isn’t incorrect in itself but it is incomplete. Because Gray Tree Frogs are often green and they spend the most important part of their lives in the water or in the ground, they defy simple description. 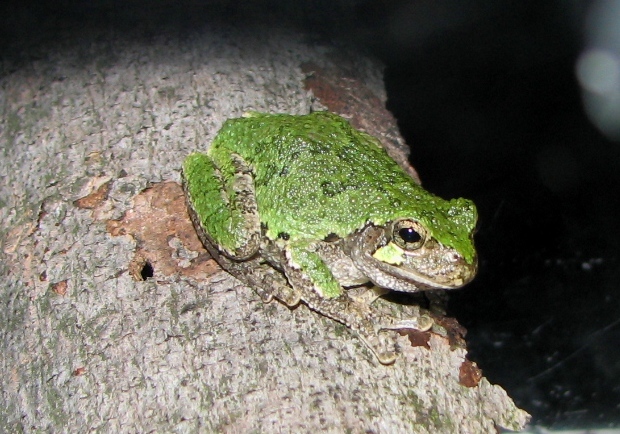 Even their scientific name –Hyla versicolor- refers to the multi-colored nature of the beast. Not all Gray Tree frogs are even Gray Tree Frogs! 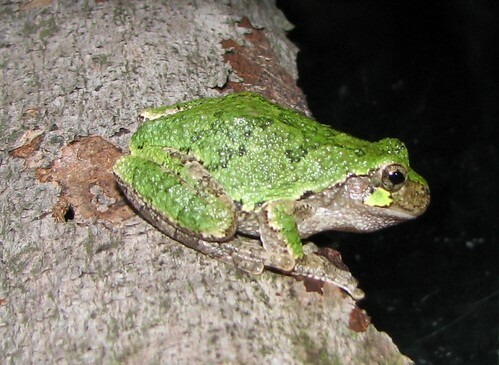 (there is a genetically different, but visually identical, species called Cope’s Tree Frog). No, if you want to be right all the time you should avoid nature entirely or get used to qualifying your statements. I suggest the latter. So, it is safe to say that all Gray Tree Frogs spend a great deal of time in trees and shrubs. They are all (note the definitive nature of this particular statement) equipped with marvelous toe pads which act like suction cups for climbing (see below). They are very adept at performing acrobatic feats thanks to their acrobatic feets and can jump from limb to limb or even climb glass. It is also safe to say that when you hear them calling during warm summer nights, you will hear that sound emanating from over your head. Here is where a qualifier needs to be inserted, because that same sound, when made on a warm spring night, is more apt to come from ground level – or, more appropriately, water level. 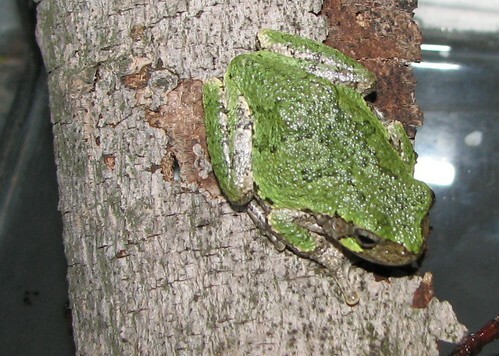 The distinctive trill of the Gray Tree Frog reminds this naturalist of the churling sounds of the raccoon. I don’t like to think about raccoons more than I have to, so let’s just say it sounds something like the churling notes of the red-bellied woodpecker. Or, if that doesn’t work for you, then just listen here and come up with your own description for goodness sake! 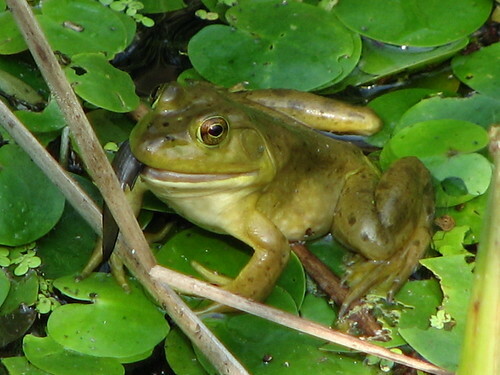 Tree Frogs come out of hibernation (in the ground, by the way) in the springtime and congregate in woodland ponds. There they commence calling in order to attract mates and lay eggs. In this regard they are like all other local frogs and toads. Although, unlike many other frogs and toads, they tend to call sporadically throughout the summer months as well. Their call is loud enough when blurted in close vicinity, but it doesn’t carry very well. I’m sure there are those who would argue with me on that last point but to those types I would suggest climbing a tree and staying there. Either way, it is generally truthful to say that Tree Frogs are heard far more frequently than they are seen. I waited until the dog days of summer to bring up this topic because it took me that long to finally get my hands on one. I’ve heard them calling from the spring pond across from my house (first part of the recording) and from mid-summer tree tops (second part of the recording) but I never had one framed within my lens until one was brought to my attention earlier in the week. The individual portrayed in these accompanying shots are the same beast even though he looks different in each picture. 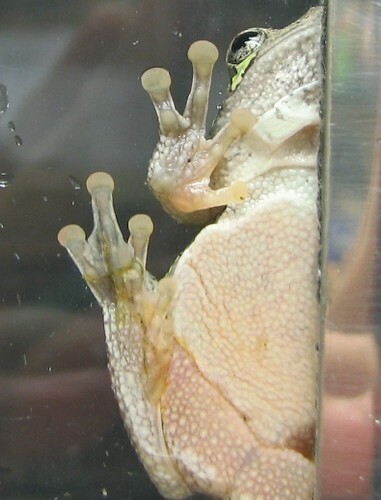 This is the problem with Gray Tree Frogs – they are hue shifters. It takes around a half hour for an individual to change color. They do so by controlling the pigment in their star-shaped skin cells. Though they can only go from green to gray and back again, they can also control the intensity of the dark splotch pattern found on the back. The sides appear to stay gray for the most part regardless of the chosen back color. 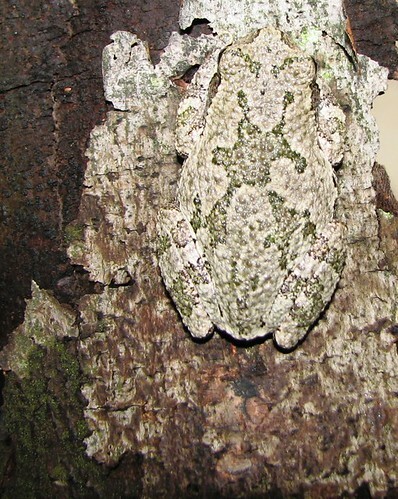 Against natural settings, Gray Tree Frogs are masters of camouflage. Since the color choice is primarily intended for the daytime rest period (they are nocturnal) Gray Tree Frogs can pass the daylight hours in either color mode depending on background. In the photo below, this fellow was resting up against the chunk of bark and his pattern matched perfectly. 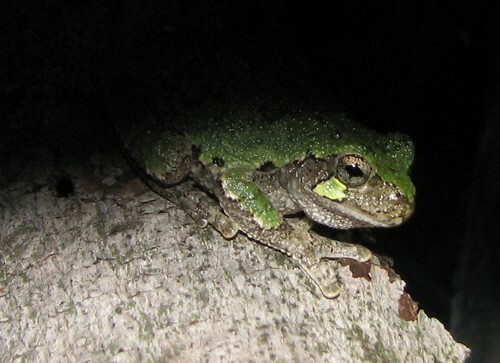 The second photo is of the same frog at night, at which time he was in green mode (see here also). Oddly enough, the reason this frog was caught in the first place was because it was attempting to blend into a pinkish gray block wall. For some reason our frog reasoned that bright green would work in order to blend into such a background. Needless to say it stood out like a sore thumb or shall we say like a tree frog on a block wall. Kyle is one of those old-fashioned kids who have no apparent interest in the trappings of the modern age. I guess I’ve known him since he was around eight or nine years of age, but it’s hard to tell. Apart from height he has not changed much and is ageless in a very good way. He delights in stomping through the reeds hunting frogs, handling turtles, and fishing. He especially likes fishing – simple fishing with simple gear. In another age he would have been called Tom Sawyer. I could always depend on him to come up with a constant stream of live specimens for the museum. Now that he’s in high school, I can still depend on him. He and his friend, Huck, (not his real name but it might as well be) have been spending quite a bit of time engaged in night fishing on the River Raisin in downtown Monroe. Two weeks ago he came in and described a fish that they caught one hot summer night in the riffled shallows. “I think it might have been one of those Madtoms,” he said in reference to another fish I introduced to him some time ago,” but it was kinda yellow and about 8 inches long.” Recognizing that Madtoms don’t get nearly that big and that if they did they would become Angry Toms, I proposed that it must have been a Stonecat. He looked at the picture and agreed. Given that I’d never actually seen a Stonecat before, I asked him what became of it. Unfortunately, he said, they put it in a friend’s aquarium and it died. “The dead fish,” I asked, “what did you do with that?” “Threw it out,” he replied regretfully (only in Kyles’ world does such a statement become regretful). I wished him luck on his further fishing adventures and off-handedly suggested that next time he captured one that he bring it in. “Dead or alive, rotten or fresh” I quipped. I should have known better than that. The following week, “Tom and Huck” walked through the door with a bucket containing a very live Stonecat. Although neither will admit it, I believe the two fished every hot sweltering night for a week in order to get me one of “those fish.” I would have felt guilty except that I know they loved every minute of it! “Huck” had even photographed the thing on his cell phone to show its true colors in case it died. At this point, my narrative needs to shift on to the fish itself before I run out of internet cyber space – or whatever you call it. I just wanted you to know that this catfish moment belongs to Kyle. Held within my hand, the creature looked and felt strangely frog-like (see here) . Not only was it scale-less, but this cat was extremely slimy and very hard to hold. Also, like any good cat, this one could scratch. It nabbed me without even blinking one of its googley eyes. There is a stout sharp spine at the leading edge of each pectoral, or side, fin. A narrow channel in the spine conducts a mild dose of venom which creates a distinct stinging sensation when injected. This is a predator defense tactic. I was injected, if only slightly, in the process of handling the fish. You can see the tiny blood spot on my hand in the portrait picture below. Fortunately, this little prick didn’t cause anything other than a short recurrence of Tourette’s Syndrome in this human. The fish died the next day. At any rate, it’s good to know that there are Stonecats living in the River Raisin. At Kyle’s fishing location, the river runs very shallow and fast over a bottom of natural rocks and pebbles. This is prime Stonecat habitat. The lower stretch of this river has seen some issues with pollution, especially where it exits out into the waters of Lake Erie, and their presence there is a positive biological health indicator. Here’s to Kyle, Huck, and the riffling Stonecats of the River Raisin. In the caterpillar world, hairiness is a means of passive defense. Most birds really don’t like to eat hairy things and for good reason. Some larval moths develop stiff irritating hairs that shed and stick like miniature barbs while others adopt the “birds will not eat a pom-pom” approach by covering themselves with long silky locks that clog up throats. The avian aversion to hair is understandable. I don’t like to eat hairy things either – extremely fuzzy peaches, for instance, are a challenge and I would never eat a whole cat. In some parts of the world where people actually eat caterpillars, they gravitate to the hairless ones such as African Mopane worms. (By the way, for those of you now forming some sort of statement pointing out that insects and peaches don’t have real hair, I wish you to stop right now. I know this and I don’t care this). Fall webworms are a fuzzy lot, so you’d think that would be enough in itself for a short happy life. 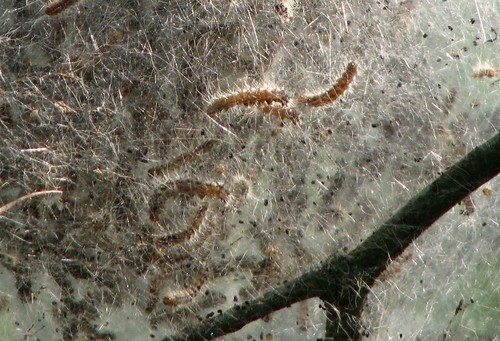 These larvae are covered with fine white silky hairs and they eventually become fuzzy white moths. That’s enough mouth-gagging pile to stop any mouth. They collectively know, however, that there are many other agents of death out there that have no aversion to hair such as parasitic wasps and ‘piller pillaging hornets. (For those of you who are now preparing to say that insects don’t really think, I would again ask you to stuff a pom-pom into your mouth). Webworms take the predator defense thing one step further by living in huge colonies surrounded by silken walls. In other words they survive by being a hair ball within a hair house – a furball protected by a firewall of fuzz – a mffffa muffash …(hey, who stuffed ‘tha cat in my mouf!). Webworm colonies are easy to spot and to contemplate. Their large silken colonies begin to appear in mid-summer and become more obvious as the season progresses into fall (thus the name). The tactic employed by these creatures, from the time they emerge, is to collectively wrap a cluster of leaves in silk and collectively eat those leaves. There can be as many as 500 individuals in group. As the members of the colony grow in size so too does their required dwelling space. They take up to six weeks to mature, so large clumps of leaves eventually become encased and stripped. The singular caterpillars never leave the confines of their silken haven until they are just about ready to grow up (they fend on their own during their last instar just before pupating). Therefore they have to live with the consequences of such cloistered living. Their old shed skins and piles of poo (see detail below) accumulate inside the web matrix and make for some pretty untidy house conditions. It’s o.k. for these kids to live in squalor as long as they are safe. Unfortunately, they are not completely shielded against the world. When a rip occurs, wasps and other small predators can still have their way with the web dwellers. You also may have noticed earlier that I said MOST birds are adverse to hairiness. There are a few who delight in such treats as long as they can find rips in the colony fabric. There is one instance in which a yellow Warbler was seen literally emptying a colony of it’s residents. Yellow-billed Cuckoos also delight in such fare. I have seen them joyfully, and repeatedly, smack small hairy caterpillars against limbs to pulverize them before eating. I guess that is the trick to eating hairy things. 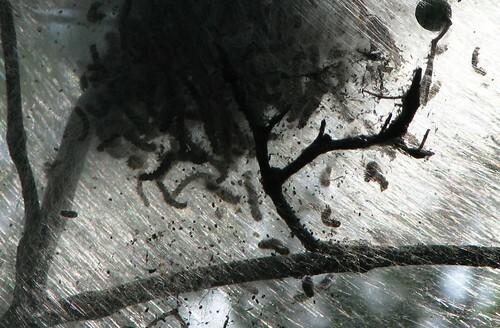 In the case of Fall Webworms, one early naturalist recorded 325 of the dead larvae in the stomach of a single cuckoo. Now, that’s a hair ball! That bird was cuckoo for …mmfho… hey, who stuffed that Pomeranian in my mouf! To wrap up this discussion, it is necessary to say that webworms are not major tree pests. 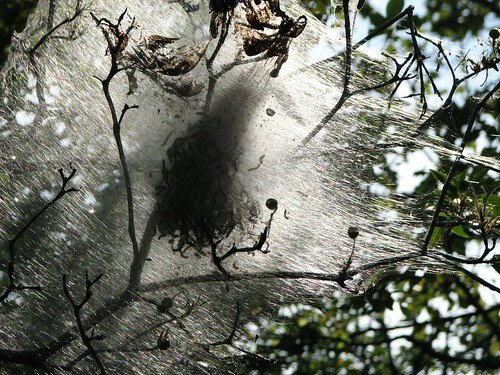 In spite of their dramatic flare for tent-building and leaf skeletonizing they do not generally cause any lasting harm. Although they seem to have a special liking for Black Walnuts in these parts, they are known to feed on around 90 species of deciduous trees. This is probably one of the largest menus known among the caterpillar world. The rest of the world may be picky about eating them, but they apparently are not picky about what they eat. Or, should I say that they are hairy liberals when it comes to tree food – fuzzmapolitans who mmph…momph…. Hey, you know, these things don’t too taste bad. 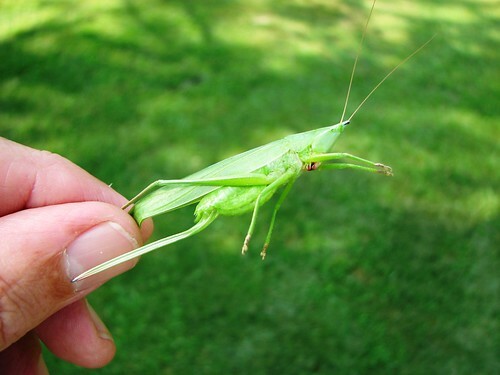 I flushed up a Katydid the other day in my yard. The thing flew up from the grass, took a short St. Louis Arch flight, and landed under the low hanging branches of the almond tree. Yes, even though I live in S.E. Michigan, I have an almond tree but it has yet to produce anything other than leaves. My Mango and coconut aren’t doing so hot either. Anyway, I pounced upon the critter like a large middle-aged cat and gave it the once over. This specimen was a pointy headed variety known as a Sword-bearing Conehead. Saturday Night Live jokes aside, the name stems from two very obvious physical traits. Scientifically it is known as Neoconocephalus ensiger which means “New cone-headed sword bearer. I am not sure what the “new” part comes from, unless it pays homage to Dan Akroyd as the original – therefore old – conehead, but the cone shaped head was apparent enough. The tip of the cone itself is flattened and the slightly rounded shape is diagnostic for this species (see beginning picture). Believe it or not, there are five cone-head species hanging around the state, so it is important to get your coneys confirmed. Fortunately, because this “Did” was a female, the sword-bearing reference was also made abundantly clear. The cutlass blade sported by this individual was really an ovipositor, or egg laying device (see above and here). It is used to penetrate between grass leaves and convey the eggs into place. 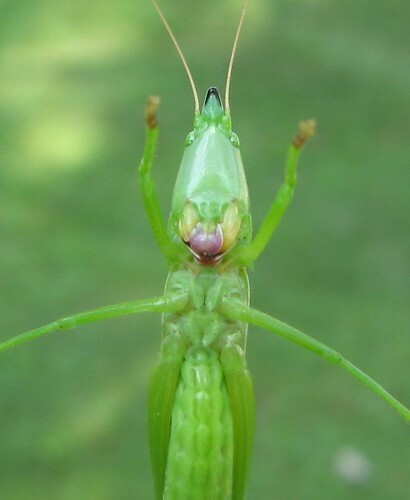 All female crickets and katydids have these structures but none match that of the sword bearer. 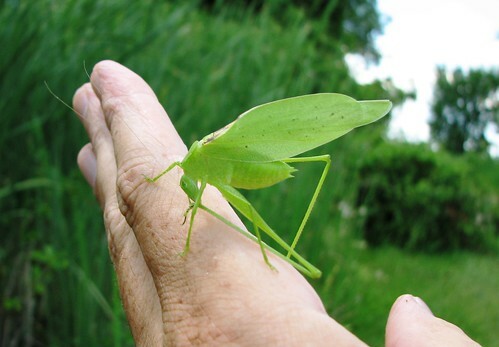 I was lucky enough to come upon another species of katydid last month next to the Acacia trees in the other corner of the yard (not really, it was in a cat-tail marsh near my house). This’n was a male Angle-winged Katydid who felt it was necessary to clean his feet before leaving my filthy human hand. You’ll see (above) that it shared the vibrant green coloring of the sword-bearer. 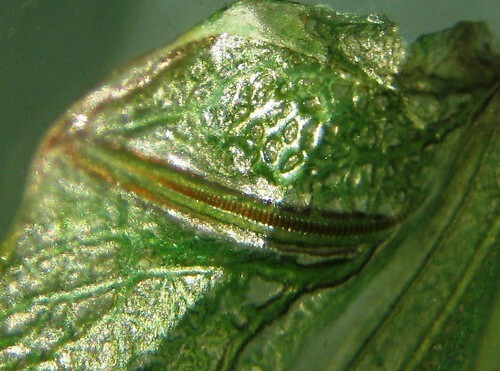 Both insects depend upon their inherent leaf-likeness to hide from predators. 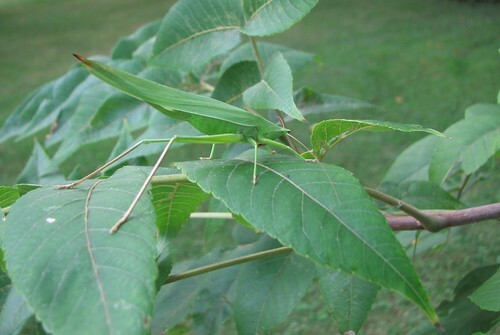 The conehead will even do a hand-stand in order to appear more leaf-like (see below). So, in combination, these sightings got me thinking about another thing that all Katys do – which is sing. They may hide and flee by the light of day but they buzz and trill by moonlight. I believe only one species actually says “Katy-did” while all the others make a variety of noises. The coneheads conduct a constant series of “lisps” at the rate of ten per second and the angle-wings “Tick-tick-tick” their way through the night. These sounds are made by rubbing one wing against the other and are usually performed by the males (although some females also engage in music making). My third Katydid encounter (a close encounter of the third kind, you see) enabled me to show you what the sound producing structure actually looks like. This one was a dead individual already hollowed out by the neighborhood ants. This Katy wasn’t doing anything anymore. I was able to pluck off one of the wings and put it under the scope for some close-up shots of the structure responsible for making all that noise. As you can see (below) there is a very distinct comb like ridge along one of the horizontal wing veins. It is about the size of the word “GOD” on a nickel (see here). An opposing ridge on the other wing is dragged along it to produce those bold percussive riffs for which the “’Dids” are so famous. I went out into the back yard late at night to see if my female conehead , or one of her suitors, might be singing. But, Katy–didn’t show up in the soundscape. I am left secretly wondering, however, if the males of the genre resented being called “Katy” and deliberately remained mum in the presence of my recorder. I think lady bug males have this same identity problem. If you spelled my name Geri, then I too would have reservations about speaking up in public. The rabbits of the world need to be alert and quick if they don’t want to be dead and still. It is their way to be perpetually frightened of everything because virtually everything is bent on killing or maiming them. When rabbits sit around campfires, they probably tell tales of killer shadows and fatal noises alongside stories about actual flesh and blood or steel and rubber predators. Given this basic truth, you can understand why I am baffled by the behavior of one of my yard bunnies. 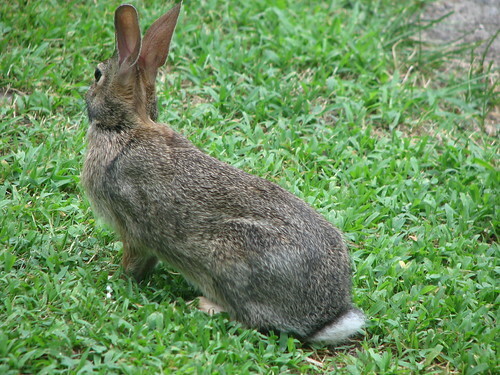 Since early summer, a cottontail rabbit has been hanging around my front door. There’s some good clover and green munchies in that location but not much in the way of cover because it is mown lawn. On top of that, the place is located only a few feet from the door itself. According to the laws of nature, this bunny should be bolting as if his tail were on fire whenever we open the door. Instead, it chooses to remain in place and allows you to approach to within a few paces before showing any notice at all. Though his eyes are upon you the whole time, he will continue to eat right up until touching distance is reached. Then, only then, will he scuttle away to the shelter of some low hanging spruce branches. It neither bolts nor flees, it just hops. Perhaps it is infected with some bunnyitis disorder or just “simple in the head,” you might say, but by all other accounts it looks and acts normal. I don’t buy into the St Francis effect either. Some might say that it recognizes my lack of hostility and therefore can be at ease in my presence. My breath doesn’t smell of hasenpfeffer and my whiskers don’t stick straight out from my face so there is no need for alarm. Nonsense – every other bunny on earth runs from me as if I were a screaming locomotive belching steam. 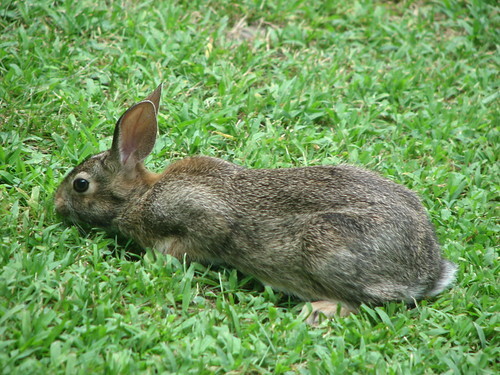 Even the backyard rabbit does that, but he’s got another oddity which I will get to in a moment. In the absence of any explanation, I was left with a calm lagomorph that sat well for observation and portrait-taking. So, I observed and took a lot of pictures. I even shot a short video sequence of the creature through the door glass. The video basically shows a rabbit eating, so I won’t inflict it on you, but does reveal a few essentials of bunny biology. The still pictures say it all (see here, here, and here as well). First of all, you can see the three essential senses – anti predator senses – at work. The eyes bulge from the head and allow for a near 360 degree view (low in depth perception but good for detecting movement). The nose is constantly aquiver to pick up stray scents and the ears are always aswivel . 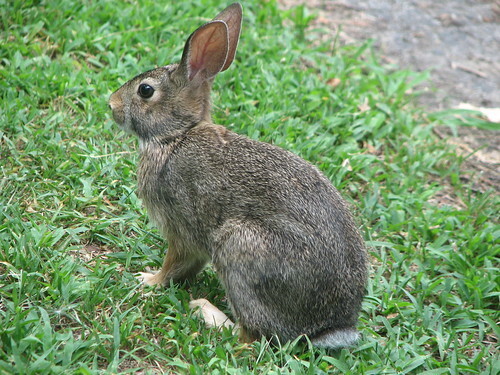 Cottontail rabbit ears are not as large as some rabbit species, but they are very large by any mammal standard. They are employed independently to scan the sonic environment and are often directed backwards. You can understand why wild bunnies are so hard to approach – normally. I was hoping to witness another phase of basic bunny reality as I logged observation time with my un-normal front yard friend, but was disappointed in this regard. Rabbits eat their own droppings in order to fully digest their cellulose content. A photo sequence of a rabbit eating crap right from its own the candy dispenser would have been special, but alas they probably perform this duty in private. This is not something you want to share with the world. Now, in regards to the backyard rabbit I have a simple story to tell. Some animal had been digging a den in the shed where I keep my John Deere mower. Whatever it was, it was throwing dirt up onto the mower deck and making a mess. In an attempt to find out what it was, I set up my trail cam. 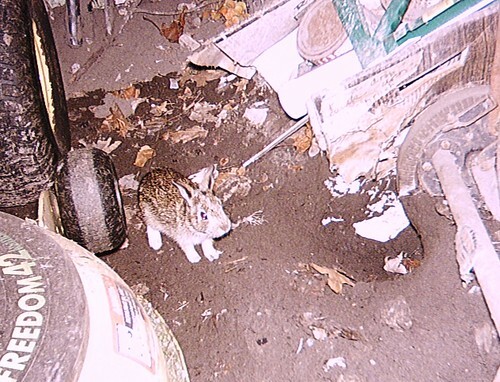 Imagine my surprise when I caught the image of a cottontail rabbit sneaking about the shed in the pre-dawn darkness (see below & here). This unlikely place was where the backyard bunny was hanging out. Come to think of it, this would be a great place to eat one’s own poop in secret! So, I have a slow rabbit in the front yard and a shed rabbit in the backyard. I wonder what kind of cottontail resides in my side yards. Stay tuned. In the world of sport fishing, a 7 ½ inch sunfish is hardly worth mention. In the world of Dollar Lake, it is. This tiny weedy lake is populated by approximately sixteen trillion micro sunfish, 5 million wiener-sized bullheads (calfheads would be more appropriate), 16 decent perch, five sub-legal pike and a one-eyed bass of undetermined size. We’ve personally hooked nearly every one of those sunfish and bullhead in our quest for something edible, but all takers barely exceeded the size of the bait. So, when my wife finally hooked into “the big one” we were naturally excited. She had managed to reel in one of the largest and most colorful Pumpkinseed Sunfish I had ever seen. 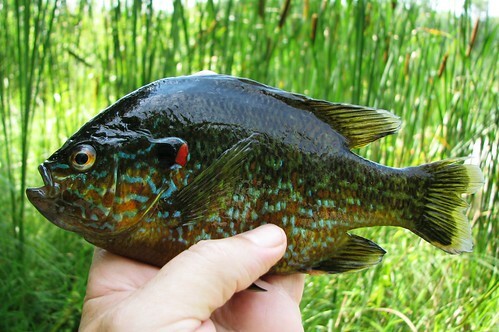 Pumpkinseed Sunfish rarely grow old and long in nature. They are food for everything else, so you could call them the mice of the aquatic world. Some individuals do manage to stay on the right side of the “big fish eat little fish” scenario. 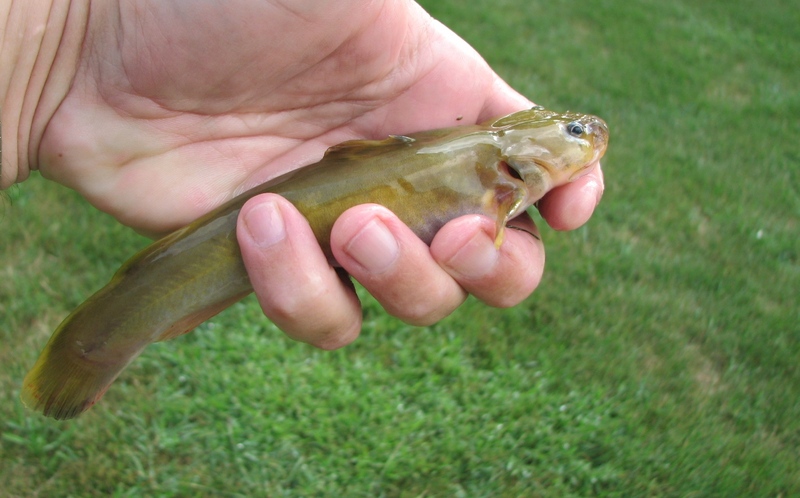 In one aging study, conducted in Michigan, a typical two year old fish was about 4 inches long. The lucky 5 years olds they were slightly over 6 inches in length and the wise old 8 year olds were nearly 8 inches long. There were few if any fish older or larger in that particular study, but it is believed that they can get to be 10 years old and 10 inches in length. Those tipping the scale at one pound would be considered fish of legend. Ignoring the laws of nature and fish ecology, I could estimate our whopper sunfish at around 8 years of age. I suppose it would be expected that I throw the fish back out of respect but frankly that was not the case. It so happened that I caught a few sizable perch and we had the makings of a meal. There is some advantage at being at the top of the food chain. I was not about to let this creature pass into my digestive system without giving it a good look-over, however. It was a beautiful thing there on the cutting board. 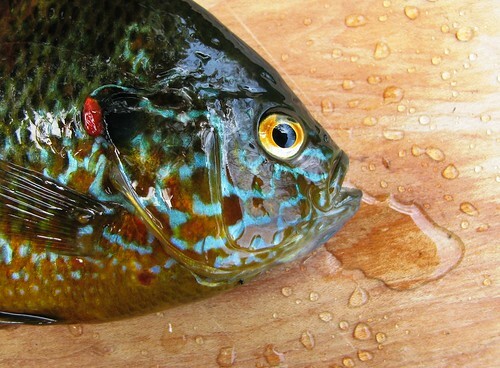 Pumpkinseeds are members of the sunfish family – with which they share billing with the likes of bluegill, warmouths, green sunfish, and large and smallmouth bass. I suppose they get their general name (sunfish) from their rounded shape and their specific name (pumpkinseed) from their flat oval squash seed outline. Scientifically they are known as Lepomis gibbosus which is latin for “scaly gilled moon fish”, or something like that. They are the shape of the full gibbous moon and therefore have the heavenly distinction of simultaneously being a sun and moon fish. 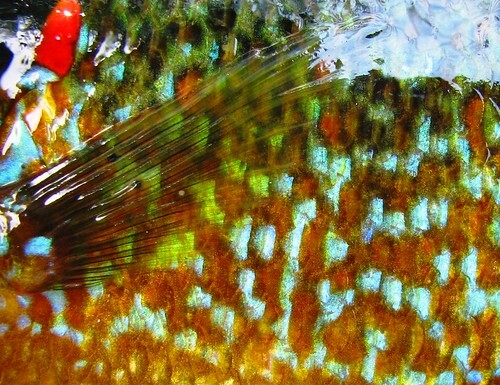 The most distinctive feature of Pumpkinseeds are the wavy sky blue lines that cross the cheeks and those scaly gill covers. A flexible flap which extends out from each gill cover is richly marked with a white-edge black spot and a scarlet half moon crescent that has to be seen in order to be believed (see here). There is more design packed into this little flap than over the entire fish. Bright orange and powder blue side spots and a burnt orange belly completed the colorful Poisson palette of this stunning male specimen. I could find no obvious fault with this fish and hesitated for quite some time before cleaning it. “Cleaning” a fish actually means “messing” it up by rendering it scaleless, headless, and gutless so I wanted to make sure I recorded this creature for posterity. Closer inspection of the long side fins, the pectorals, revealed black dots imbedded in the flesh. These were the resting stages of a parasitic flatworm that use the fish as a temporary home. Their ultimate goal is to find their way into the gut of a Kingfisher where they complete their development. 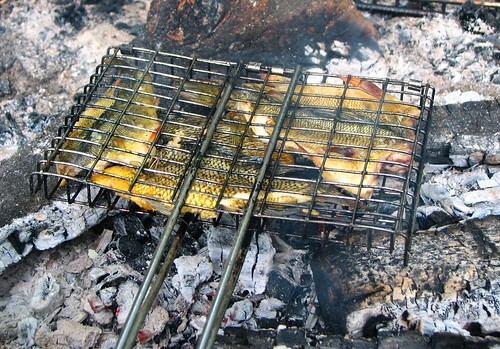 So, for the sake of saving our local Kingfishers from parasitic infection, I filleted the sunfish and, along with a few of the perch, roasted them to perfection over a wood fire. Complimented with roasted garlic and a few mystery spices, this beautiful sunfish became a beautiful evening meal. There is nothing like eating a sun fish under the glow of a rising moon (even if that moon was hidden behind rain clouds).